Till now Google Search settings (or preferences) were managed at the web browser level. However, now you can manage Search settings at Google Account level. 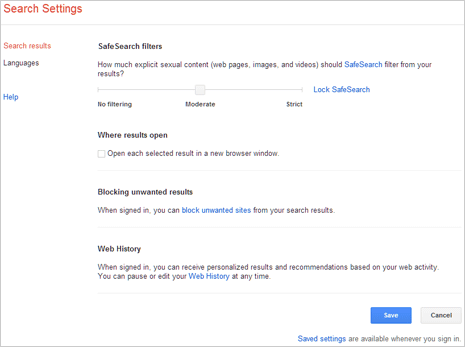 As a result, while using Google Search on different web browsers like Chrome, Firefox and even on different computers – you should see same web results as same Search Settings are used through your Google Account. To set this up, just configure and save Search Settings in your Google Account. 1. Open Google.com and click Sign in button to login into your Google Account. Once loggged in, search for any keyword on Google and on results page click on Settings icon and then click “Search Settings” option. Alternatively, you can directly open google.com/preferences to access Settings page. 2. On Search Settings page you can configure and customize number of things for Google Search. You can customize for: Safe Search filters, Google Instant predictions, number of results per page, results open in new or same browser window, blocking unwanted results and web history. Can I use Saved settings without login – Yes, you can save settings without logging into Google Account by using above procedure and start using Google Search. However, once you delete cookies, change web browser or computer – Search Settings will be reset. For constant Search Settings on different browsers and computers – use save search settings feature and remained logged into Google account while searching.